The Cat Factor: Meet Your Colleagues! 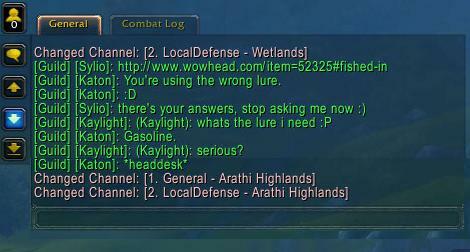 The night after, my veteran guild mate, Kaylight, was asking for some information on how to fish some volatile fire. Yes, in W.o.W. you can sometimes fish anything but the actual fishes. Even fire. Seeing how he kept failing, Sylio was trying to help, linking some information from wowhead.com. I (Katon) wasn't.